Launch the App Store from the Dock and log in with your (or your organization’s) Apple ID. Purchase Mac OS X Server or if you’ve already purchased it, go to the Purchases icon in the toolbar and click the Install button. After a short download, another installer launches, displaying Welcome to Server. Click Continue in the Welcome to Server window and then click Agree to the Software License. Click Continue in the Install Software window. At this point, the installer begins to download server software. 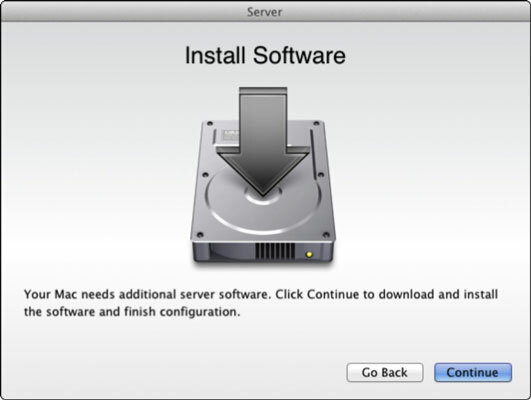 In the Configuring Services window that appears after the download and installation of software is complete, click Finish. The Server app opens, with the Next Steps pane expanded at the bottom. Lion Server is installed and ready for configuration.